The Muse Brooklyn is, above all else, a creative community. 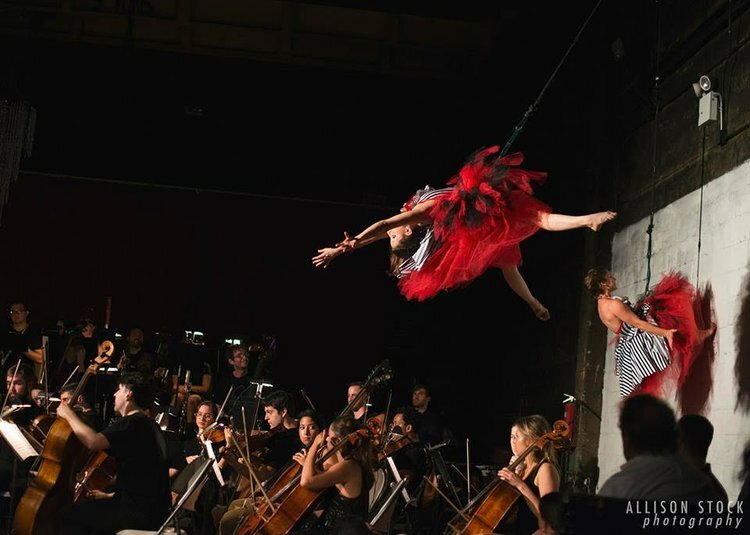 We are a home for artists from all over the world, and together we celebrate circus in all its forms: circus as therapy, as fitness, as a form of play, and especially as high quality art and spectacular entertainment. We dream of a world where artistry, physicality, and creativity can flourish: and we work hard to make sure our programming is affordable, welcoming, and fun. New York City, with it’s continuous mosaic of eccentric characters and absurd happenstances, may at times make one feel as though they’ve joined the greatest show on earth. 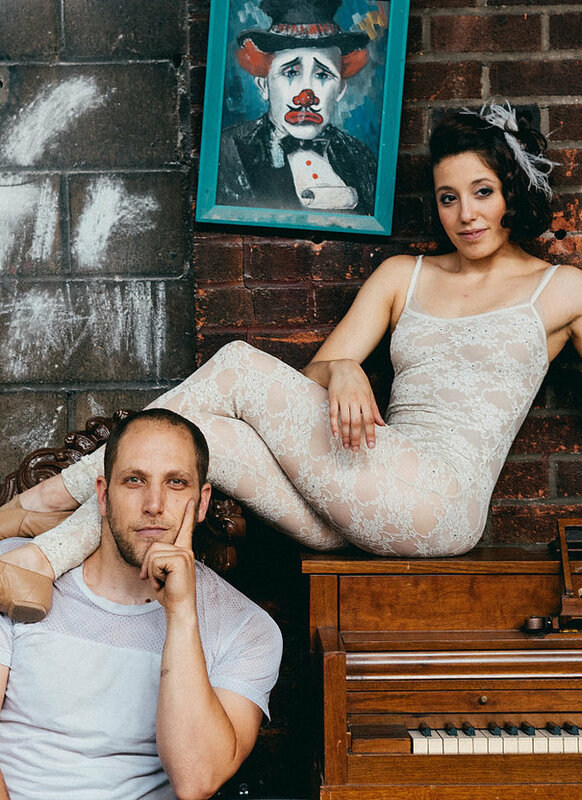 Ringleader and originator of Muse, Brooklyn’s premier circus school and event facility, New York native Angela Buccinni and her partner from Israel, Yoni Kallai, have pursued this sensation into profession. Muse is one of several 21st century Brooklyn staples of creative conductivity that was expelled from Domino Sugar Factory’s parking garage, former home of Glasslands, 285 Kent, and Death by Audio to name a few, as a result of sabotage by Vice Magazine. What began as a humble at home production quickly launched into a whirlwind adventure showcasing the enthusiastic demand for this kind of artistic community. Together they take us on their theatrical journey through the daunting landscape of uncertainty guided by an unassailable faith that serves as a testimony to the prevailing power of will finding it’s way. Angela was drawn to the luminosity of the limelight at age 6 when she began exploring her passion for dance. Angela: When I was little I used to rollerblade to the dance studio and wash the mirrors so I could take my lessons. I worked very hard from the time I was young to make sure I could dance. I was set on the path to do ballet and modern; I went to a conservatory program where I leaned more towards choreography, then college, then wound up in New York and was auditioning for a good 2 years. I was always getting to the last 2 girls at the audition and then never getting the job. 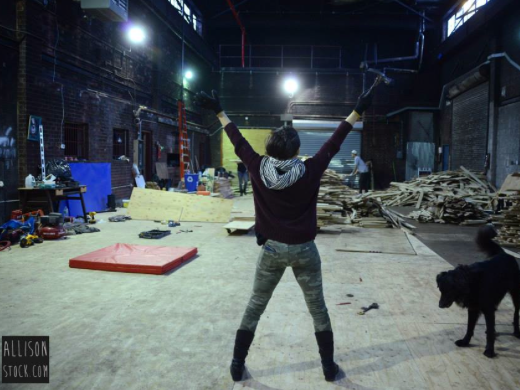 Then I auditioned for Elizabeth Strebs Company ,and they embraced me and brought me into their internship program and I got to train there and did a little bit of flying trapeze. That became home and I very much so try to model the feeling I had there in the beginning as what I want here, because it was the first time in New York that I felt that someone gave me a damn hug. I ended up quitting my job and working only there even though it was only a fraction of the money, but it just felt right and from there I built skills and started booking jobs where they’d say “we need a dancer who’s not afraid to do these things and we’ll train them.” They gifted me the confidence in those skills, and once I started getting up in the air and learning these things I was like “Oh, I’m not going back, not going back down, ever, never going back!” Now it’s still a big part of my career. I get jobs or shows that are somehow a combination of these skills. Do you feel you were born performers? Angela: I used to get really scared or nervous before going on stage, but at the same time I couldn’t wait til the next. It was a nice opportunity to have this experience with people in a different way because I didn’t talk a lot as a kid so it was a way for me to communicate that felt very natural or right to me; it scared me but it was good for me. Yoni: I did some performances with my brother who was a big actor but it was never my world. I was in university and I got myself an engineering degree but I didn’t want to sit in front of a computer all day and type. I wanted to be physically active and interactive with people and work hard. Between university and coming to NY I was working in construction, so it’s kinda strange. I got into this whole thing because I like the practice just in the connection with people, it lends itself to performing and I do it but it’s not my main motivation. A: Sometimes I laugh, sometimes I cry. It’s really terrifying, it’s terrible. I haven’t fallen in a performance in our work together. I have had some major injuries in other shows I’ve done. It is scary, I have lost friends who are in the field to acrobatic accidents. It’s all about play and a lot of fun and then there are those moments when you have a reality check of your mortality. In order to manifest the current space, a 7,000 square foot warehouse with enormous ceilings and legroom conveniently located near the resting place of Harry Houdini, a deviation from logical control over circumstance was required, submitting to the currents of creation in motion and allowing the tides of destiny to construct their ultimate dream. A: So the backyard in Bushwick- there was a freak tornado in 2010 that hit brooklyn and it hit the house next door and uprooted a tree and dumped it onto our yard. At that point I didn’t know what I should do; the studio was closed and I had an opportunity to go on tour so I took it. It brought me through Israel and that’s what eventually led me to connecting with Yoni. While touring, Angela launched a Kickstarter to reopen the backyard space as a full blown tent. The canvas enclosure style was first employed by troupes trailing alongside the westward journey the original pioneers of the American dream were carving towards the new frontier and beyond. But if the nostalgia of nomadic ventures was the intention, she was about to get more than she bargained for. Upon returning to Brooklyn, Angela received a disturbing wake up call from a double homicide next door with one of the people shot going down in her backyard. Confronted with another reality check, she realized that the situation was too unstable to continue bringing people in. A: They strongly advised me to basically just move and get far away from it. There were 4 of us living in the house at the time, so we packed up our bags, loaded up the truck, and moved into a vacant warehouse in Williamsburg. There was a sink and 2 toilets; no shower, no kitchen, no rooms, so the 4 of us lived in the main body of the warehouse as we built up a living space. We built up everything from scratch, and then we had a home and started the studio in the living room, this is 2011, when the business was officially registered. The tornado ripped it up for a reason it was like “ok you’re done you have to go to this warehouse do this thing and that will build up the community even more” and now it’s this thing. I don’t think we even knew what were getting into in starting the studio. But this wouldn’t be the last hoop to jump through. Enter the next antagonist in the form of Vice Magazine, who’s imperialistic conquest left them hovering in limbo once more. A: We got swiped out- we were actually supposed to have a few months left on our lease but they started construction and bits of our ceiling started falling in and there were sparks coming over so we had to wrap up business and get out early. So they packed their bags again and moved into the current space, a drastic transformation from the trashed condition they found it in. From December to April 2015 they were in heavy construction with the help of volunteers and a few professionals. Almost everything was repurposed, including the acquisition of $120,000 of freshly laid wood that someone had changed their mind about last minute. The stage was donated, and the booths are from Galapagos who lost their space in Dumbo from getting bumped out. A: At the time we lost the old Muse a lot of spaces were closing and I do think it’s a crisis in NY right now, of artist spaces becoming fewer and far between and more so getting pushed further and further away, and I think it could get to the point where everything is driven so far out that you lose the point of being in NY. I think they’re going to start importing more and more art rather than actually having local stuff brewed here. Tyranny, the indomitable chaos of nature, and magical resilience! But what would the struggle amount to without the added fairytale element of true romance? When did the two of you begin working together? Y: The first time that we met was at the First Israeli Acrobatics Convention. I was still in university and I was working in israel. We had very brief contact and that’s it. The following year I was there again kind of by chance. She was living back in NY- we met again and she started asking if I wanted to move to NY and become her base. A: There was no romantic anything, we didn’t date for a long time, everything was built on play, trust, and communication. We became really good friends and that second time we met at the convention I didn’t trust many people to be throwing me around, but I trusted him, I felt very safe with Yoni. He was the one that would translate for me and make sure that I was always included in things. There were things at the convention I had my reservations about, I wanted to pursue acrobatics but I didn’t have a partner. I found the world fascinating but wasn’t sure if i was capable of it, but somehow together we were capable of a lot, so I asked him to come down here and work together. I was like- I really don’t know if we would book work, I have a studio, we can train, we can go to Montreal to get coaching- I have no clue how this will work, but you’re still welcome to come and he came. We worked together very closely and very intense training for 9 months and then after that 9 months he was committed to go back to Israel for a year. Y: In 2 days it will be a year since I came. What’s the best part about seeing your creation come to life? A: I’ve had moments where i just wanna throw the towel in, it just gets too hard. I think we’re still very much so in hard times right now trying to get over that last transition and hump. We’re still not financially stable and it’s really rocky, but then there are moments where I see someone who’s worked really hard in classes achieve to the next level and their celebration and joy or I see some of the little kids saying things like “I can fly!” and you see through other people’s experiences. Sometimes when there a show I’m watching the audience so I’m seeing them relive something that I went through, which is the reason that I got into this. Y: I think for me performance- wise I like to make things funny, but I think I find more moments of joy working with people in a class and just meeting someone somewhere and doing something with them. I had an experience a few months ago with a bunch of friends in Israel just next to a waterhole in the desert. This one woman was having a hard time, she wanted to go in the water but was afraid because it was cold. I naturally felt like I could support her and help her choose to go in and not be pushed in. That’s what I enjoy. It’s not my work really, I just do it. Yoni has been exploring his ability to encourage others to participate through “play-working sessions” where he focuses on listening to students one on one and getting them to open up. 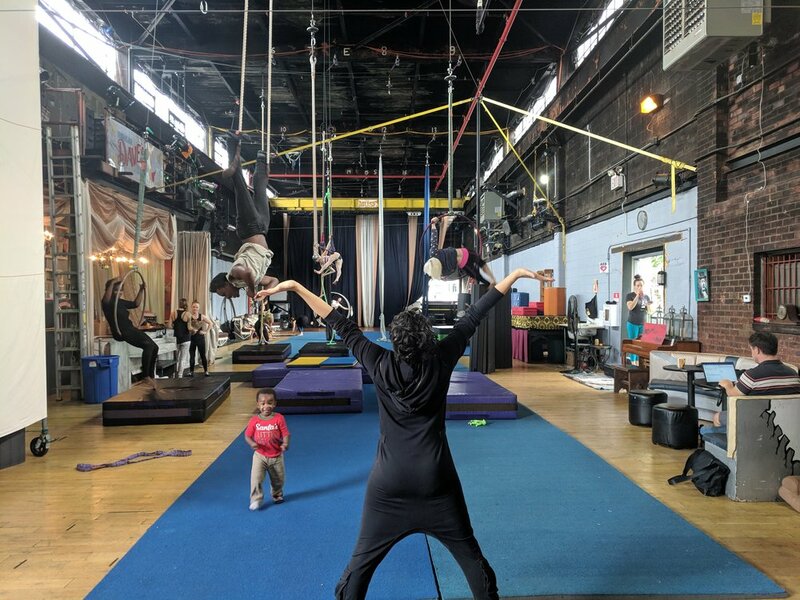 With the understanding that circus can be very therapeutic, Muse hopes to eventually develop programs with special harnesses that work with all sorts of disabilities, in addition to the already multifaceted curriculum that includes handstand classes, ballet conditioning, and acro jam/ acro yoga sessions. What are the lifestyle benefits of this kind of exercise? Y: Playing and interacting with people while being physically active. A: In teaching too, together we notice a lot and one thing we love about sharing this with others is seeing people’s minds change about what they’re actually capable of. Even when Yoni and I first saw acrobatics, hand to hand specifically, it was something I felt for me was unattainable, I wasn’t capable of it. I admired it and was like “wow that’s really amazing, God I wish someday…” and then slowly you start to build these blocks and you understand it’s just a matter of time, training, and willingness to keep going. Their idea of circus is not a passive panoptic performance for the audience, but interactive play that encourages the entertained to partake in the entertaining. Y: Personally I like to not have that boundary and I like to pull people up from the audience to do simple acrobatic tricks to show people that they can do a lot more that they think. Often I’ll take the smallest girl I can find and go into an inversion where all my weight is on her and they always hold it and they’re so surprised. A: For me it’s similar, I’ve performed at Radio City before and off broadway, so I feel like I’ve had a big spectrum of lots of different audiences and it’s more special when it’s very intimate and that fourth wall is gone. I like to create shows where the boundary isn’t there, so its ok for you to touch an audience member, it’s ok for you to go right up to them or hug them in the middle of your performance. If something is not completely or tightly constructed the performer has freedom to make choices and feel what’s actually happening. I think what we have in common is the connection with people, if we have a small show with 30 people, I can come close and look someone in the eye and make them feel something and get them to have an experience that they haven’t had before. I’ve noticed in acrobatic performances that there seems to be this incredible defiance of gravity. Do you think that it’s possible for humans to fly? A: In my dreams as a kid I used to be able to jump and swim through the air and choose when I came down. I think that desire’s always there; I think we can all fly it’s just a matter of when gravity decides to kick in. Do you think gravity is thought? I wish it was only a thought, unfortunately I’ve felt the effects of it’s results. When they’re not challenging the laws of physics, the space is rented out to a myriad of amusing acts, including most recently The Acro-Cats, a rock band and acrobatic ensemble comprised of 5 cat performers. You want to focus on bringing the artistic community into this space. A: Yeah, we do coproduction type opportunities where if there’s a small company that’s not as established and wants to produce a show, we grant them rehearsal space and the ticket proceeds from the show go back to fund the space. There’s a lot of dead hours that we want to try and give to as many artists as possible and in return they help us bring in an audience and keep the space going. That’s a real struggle in NY- to keep doors open. There’s high competition for jobs that immediately sets up this territorial environment where you become very scared to show your material or teach someone else because all of the sudden they’re gonna take it or get that job. I think if we share we could only all get better and the bar will keep going up, up, up. It’s the only way for us to keep up with the rest of the world. In other places they’re like that, really open with the knowledge they have and wanting to gift it. The more people we have using the space, loving the space, wanting to be a part of it, the better.